Who doesn’t want healthy and hydrated skin? I feel women (especially) are forever in search for the best fix to give them glowing, clear, healthy, wrinkle-free skin, I know I am! I was inspired to share this topic today because lately I had been getting asked how to get a healthy skin glow. I wanted to share one easy and inexpensive way to do so. 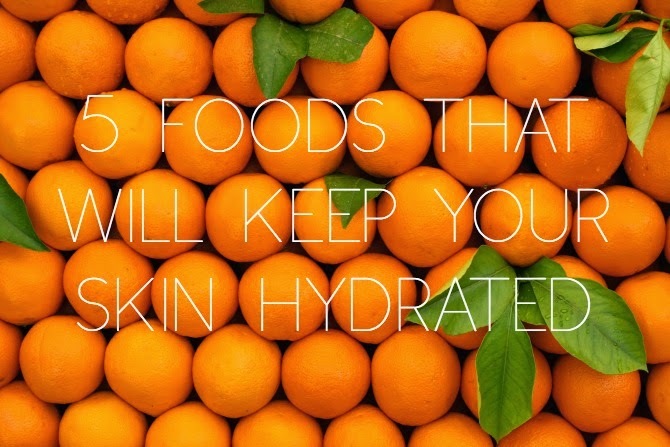 Did you know that some foods that help keep your skin nourished and hydrated? These are foods that I eat on a regular basis and they not only promote good health on the inside, but also on the outside (your skin). 1) Oatmeal- It’s a water-rich food to help your skin stay moist. It’s a great source of manganese, which helps create protein (collagen and elastin, which are structural proteins for your skin) and it helps protect skin cells from damage caused by a build up of free radicals. 2) Tuna: The omega-3 fatty acids in tuna and other oily fish help promote moist skin and protects the skin. Tuna and salmon are also a source of the B vitamin-biotin, which is essential in the winter since not getting enough can contribute to scaly skin. 3) Spinach: In addition to being packed with Vitamin A-a known skin strengthener, spinach is filled with folate that helps hydrate skin. 5) Oranges-Loaded with water content and the talon makes them a great hydrator for skin. They also have a ton of vitamin C, a water soluble vitamin that works as an antioxidant to protect all body cells-including skin cells-from free radical damage. Vit C also created collage- the bodes main structural protein that holds skin, ones, and other tissues together. These 5 foods will definitely help my skin hydrate. By the way, I have some foods I know that could hydrate skin too. Nuts & seeds, extra virgin olive oil, eggs and WATER. Hope it helps.